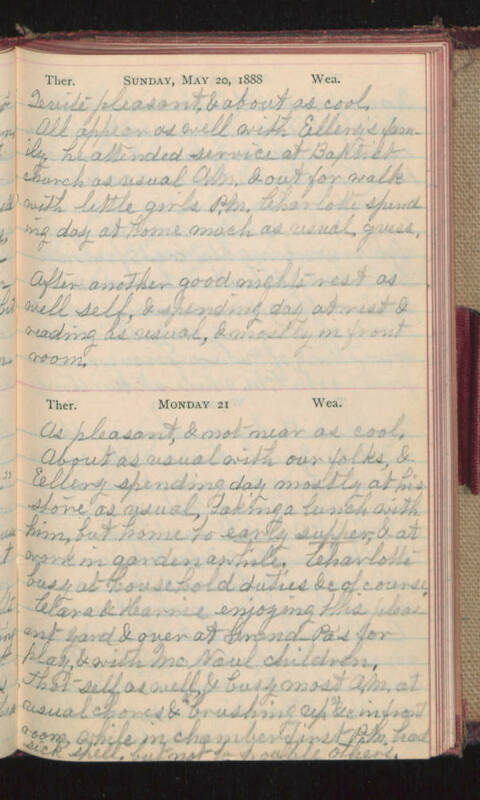 Sunday, May 20, 1888 Quite pleasant, & about as cool. All appear as well with Ellery's family, he attended service at Baptist church as usual A.M. & out for walk with little girls P.M. Charlotte spending day at home much as usual guess. After another good nights rest as well self, & spending day at rest & reading as usual, & mostly in front room. Monday 21 As pleasant, & not near as cool. About as usual with our folks, & Ellery spending day mostly at his store as usual, taking a lunch with him, but home to early supper, & at work in garden awhile. Charlotte busy at household duties &c of course. Clara & Karrie enjoying this pleasant yard & over at Grand-Pa's for play, & with McNoul children. That self as well, & busy most A.M. at usual chores & "brushing up" &c in front room while in chamber first P.M. had sick spell, but not to trouble others.